“Somewhere Between a Juice Cleanse and a Donut” - Love my new tank! I have had lots of questions about the “Faster Way to Fat Loss” program and since the next round starts MONDAY, February 11th, I thought I would try to answer some of those questions today! I started the FWTFL program in January of 2017. 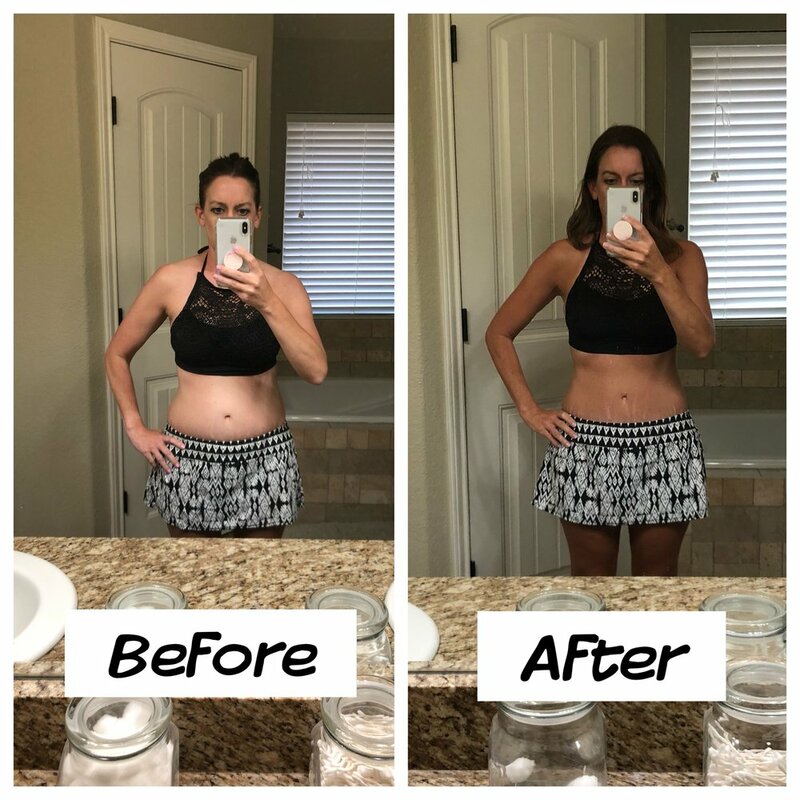 I joined because I was wanting to lose a little weight but more importantly wanted to tone and learn to lift weights. I can do all the cardio on my own however I wasn’t an athlete growing up and never learned to lift weights. Now that I’m getting older, I have read so many benefits of weight lifting that I wanted to learn the proper techniques as well as learn some good workouts. Also, I work out from home so the fact that this program offers an at-home workout as well as a gym workout was perfect for me! The FWTFL is an online nutrition and fitness program which focuses on intermittent fasting where you learn to carb cycle and track your macros. We learn the proper way to fuel our bodies with the right foods at the right time in order to burn fat effectively. This is a six week program with one week being prep week so it ends up being a total of seven weeks. During prep week, you will learn about fasting, how to calculate calories and macros, and set up your My Fitness Pal app. Intermittent fasting is an eating schedule training your body to burn fat. We intermittent fast every day which means you consume your calories within an eight hour feeding window. My window is usually 12-8pm. A macronutrient is your proteins, fats, and carbs. You will use the MY FITNESS PAL app (free version!) to track your daily macros. It is super easy and your coach will teach you how to set it up and use the app during prep week. If you have no idea what a macro is…it’s ok! I didn’t either before starting! In the Faster Way to Fat Loss, you will have two low carb days, two low macro days, and three regular macro days. You will eat real foods - no shakes to buy or pills. It is all about learning when best to each which types of foods. For instance, you will eat more vegetables on low carb days and less fruit to hit your macros but then eat your fruits on the other days. You will be provided with beginner workouts, at-home workouts, and gym workouts. I do ALL of my workouts at home. No gym membership here! But again, you have the option of either or both. So if you want to work out at home some and the gym other times, go for it! They also provide modifications for beginners or anyone who has restrictions. Again, you have access to your trainer and they are always quick to respond to your questions! You will workout 5 days a week with 2 active recovery days (rest or a low impact activity such as a walk). The workouts range from 30-45min. You will get faster once you know all the exercises! You will have videos to help make sure you are doing them correctly! Sleep is important. Drinking ALL your water is important. And rest is important. Listen to your body and ask your coach/trainers questions anytime! HOW DO YOU NOT EAT UNTIL NOON EVERY DAY? For me, this was easy because I have never been a breakfast girl. I love breakfast for dinner but not first thing in the morning. During prep week, you will start to increase your fasting and begin eating only during your feeding window. You can do this gradually during prep week to allow your body to adjust. However, it really comes down to drinking lots of water, lots of hot tea or coffee, and lots of willpower! Yes, you can have creamer in your coffee (AMEN!) as long as you stay under 50 calories so you don’t break your fast. WHAT IF I AM NURSING? WILL IT AFFECT MY MILK SUPPLY? Nope! The creator of the FWTFL, Amanda Tress, nursed as well as many others and still were able to keep up the Faster Way lifestyle. Modifications will be made for your calories, carbs, and water intake. Leg day is Saturday which is TREAT day! Amanda LOVES her a donut and you’ll see she has one EVERY. SINGLE. WEEK. Yes, you’ll find yourself looking forward to your treat at the end of your week! You don’t have to use Facebook to join however I would HIGHLY encourage you to at least open an account just for this program. The reason is that you will be placed in a Facebook group with other ladies doing the same six week program. It is SO beneficial! It’s a great accountability group, great place to ask the trainers questions or see other’s questions and answers. You will share meal ideas, low carb day ideas, and recipes. It is SO MOTIVATING and you’ll come to love your group! That being said, if you are not comfortable with Facebook, you will be able to email questions and contact trainers that way. I AM A WORKING MOM. MY HUSBAND TRAVELS. I’M CRAZY BUSY. CAN I DO THIS? Absolutely! I am a working mother and business owner. I have four kids ranging from college to elementary age who are involved in every sport you can imagine! My husband works full-time, we are involved with church, and on the go ALL THE TIME! The questions is “Do YOU want to do this?” If so, COMMIT and GET IT DONE! Don’t make excuses! I PROMISE you, you WILL LOVE IT! YOU ARE WORTH IT! Here is a picture of my before and after. Friends, this is after ONE round! SIX WEEKS! You will have MORE ENERGY, FEEL BETTER, SLEEP BETTER, and you will EAT MORE than you think! I eat more calories now because I’m eating the RIGHT calories! I truly love this program so much! I have had other friends do it and love it too! It’s not a diet - it’s a lifestyle and one you can maintain! Ok, what other questions do you have for me? Comment and I’ll get back with you! To learn more about the FASTER WAY TO FAT LOSS click HERE. And if you already know you want to sign up, you can register HERE. Next round starts MONDAY!! February 11th! Join me!